This game is played exactly like the ever-polular “4 Squares”, with the obvious difference being that there are only three squares in our version. Being able to play with one less player than the traditional version should allow for more games, and therefore more exercise. 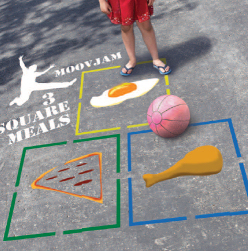 Moovjam has incorporated the “3-square meals” theme into the game, to instill the concept of eating three healthy and complete meals per day, namely: breakfast, lunch and dinner. This message will be reinforced not only to those who are playing the game, but also to onlookers and passersby. A residual effect is that the game encourages family meals, which has it’s own terrific benefits. This game is played like the classic Hopscotch game. 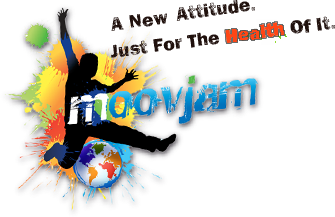 The Moovjam version is more enticing to children because of the dynamic shapes, vibrant colors, and curved path. 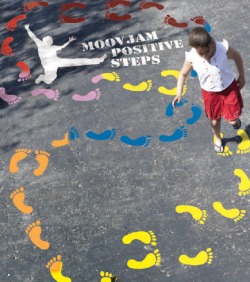 The Moovjam version is enhanced by footprints that mark the starting point. Footprints have a magnetic effect on children, who are tempted to step on them. What better way to attract children to the game, literally. Lastly, the untraditional curved path in our version makes it more challenging and fun. Children will be hopping themselves into shape in no time. 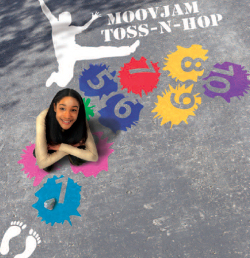 This game is a Moovjam original, and it allows YOU to determine the shape, length and complexity. The idea is to create a path of footprints that will have children stepping, jumping, hopping, lunging, spinning and stretching as they work their way around it. The path may have children going backwards, or hopping on one foot… the options are limitless. This game will teach children coordination and balance while it allows them to burn calories and improve stamina and muscle tone. We suggest that the path be made as a continual loop so there is no starting and stopping point. This way, any number of children can “step” into the game at any point, and they will be encouraged to continue around and around until they decide to stop. This game can be set on a wall and played with a ball, or on the ground and played with a pebble, beanbag, coin, or other small object that won’t roll. The object is to throw the ball, or to toss a small object so that it hits or lands on the target. The closer the players get to the center, the more points they receive. The length of time and the distance from the target can be determined by the players and/or a supervisor. This can also be a fun team game. 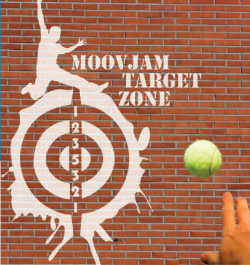 The Moovjam Target Zone teaches hand-eye coordination, helps build fine motor skills, and encourages outdoor exercise.